We love rolling back the years for a trip down memory lane - and today we’re going back to Sunderland in 1994. What do you remember from that year? Coronation Street's Reg Holdworth alias Ken Morely visits the Regal bingo at Concord, Washington. Pictured checking Kathleen Gibson's card. 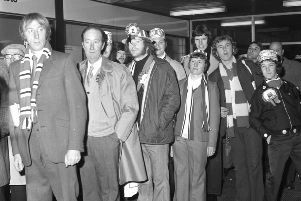 In the Sunderland Echo archive we found some great shots from yesteryear, including a visit from a Coronation Street star, meeting a local netball team and taking on snow on the region’s roads. It all sounds very familiar! Tune in to our slideshow to see if you can spot any familiar faces amongst the photographs. •If you’re looking for more nostalgia coverage don’t forget to visit our dedicated Facebook group Wearside Echoes, for more memories of growing up in Sunderland and Durham.